Background Solid aneurysmal bone cyst or reparative granuloma of bone is a rare tumorlike condition that primarily affects the bone. It was first described by Jafe et al. as a non-neoplastic giant cell reparative granuloma of bone. Patients and methods This study included nine patients, with five males. Age ranged from 6 to 34 years at presentation, with mean age of 15.5 years. Femur was affected in three patients, where two of them was in the trochanteric region, and the third ones showed a recurrent distal femoral lesion; followed by distal tibia in two cases, where one of them also was a recurrent lesion; and a single case each in proximal tibia, distal ulna, clavicle, and pelvis. All cases were histologically diagnosed by either incisional biopsy (five cases) or after final treatment. Some cases had radiological and pathological differential diagnoses such as giant cell tumor, hyperparathyroidism, and osteosarcoma. Seven cases were treated by thorough curettage and hydrogen peroxide lavage, with an autologous nonvascularized fibula in two cases. Two cases were managed by en block excision. Follow-up period ranged from 18 to 50 months, with mean follow-up of 33.6 months. Results All curetted cases healed completely without local recurrence. All cases had excellent functional outcome. Conclusion Solid aneurysmal bone cyst is slightly different from ordinary type as it has wider age incidence, and it might have serious differential diagnosis as osteosarcoma, but it is treated almost the same way. Solid aneurymal bone cyst (SABC) or reparative granuloma of bone is a rare tumorlike condition that primarily affects the bone. It was first prescribed by Jaffe  as a non-neoplastic giant cell reparative granuloma of bone. Similar histological lesions were described by Sanerkein et al. under the name of SABC. Nowadays, those two terms are used interchangeably to describe the same lesion ,,. Histologically, SABC shows a mixed cell population with unevenly distributed giant cells that look smaller than those of giant cell tumor, which has larger and evenly located giant cells. Moreover, SABC may contain some osteoid matrix and mitotic figures with hemosiderin deposition . It is similar to aneurysmal bone cyst but without the blood-filled cavities ,,,,,. Clinically, this lesion usually affects small bones of hands and feet and skull bones but can affect long bones as well . Patients in the second and third decades of life are most affected. Lesions might affect the medulla of long bones or even the cortex, or it can be subperiosteal and multicentric. Radiological features of SABC are radiolucent multilocular lesion that is often located eccentrically in the medulla of long bone or even intracortically. Under magnetic resonance imaging, the lesion shows higher signal intensity in T2 sequence than similar lesions because of the intense edema ,. The variable histology and nonspecific radiological features put this lesion in a list of differential diagnoses such as aneurysmal bone cyst, giant cell tumor, enchondroma, and brown tumor of hyperparathyroidism. However, the most important histological differential diagnosis is the low-grade giant cell-rich central osteosarcoma ,,,. SABC is managed the same way as the conventional type by intralesional curettage with or without adjuvant treatment in the form of using tools to minimize local recurrence such liquid nitrogen or phenol. ,,,. The reported local recurrence in some series ranged from no recurrence to approximately 70% , but it seems to be much less regarding lesions in long bones in some published work ,. A fully informed consent was obtained from all patients, Treatment plans were revised and done according to the ethical standards of our institution as well as the international standards. This study included nine patients; five of them were males. Age ranged from 6 to 34 years at presentation, with mean age of 15.5 years. Femur was affected in three patients, with two of them had it in the trochanteric region and the third was a recurrent distal femoral lesion. The distal tibia was affected in two cases, where one of them was a recurrent lesion, and single case each was present in the proximal tibia, distal ulna, clavicle, and superior pubic ramus of pelvis ([Table 1]). Diagnosis of the condition was based on histological examination either after definitive treatment or by incisional biopsy. Incisional biopsy was performed in five cases because of the clinical and radiological suspicion of a more serious problem. In some of those biopsies, it was not easy to reach a final conclusion of SABC, and the reports showed a list of differential diagnoses, such as giant cell tumor in three lesions of the recurrent distal tibia, proximal tibia, and distal ulnar cases. Furthermore, osteosarcoma was a differential diagnosis in the two distal tibial cases. Hyperparathyroidism also was a differential diagnosis in the recurrent distal tibial case as well ([Table 2]). Final diagnosis of these cases was reached after repeating the reading of the slides by more than one pathologist and clinical correlation of age of the patient and the anatomical site with the radiological findings of each patient. Treatment was en bloc excision in two cases: the distal ulnar case and the case of the clavicle ([Figure 1]). Thorough curettage was the line of treatment in other cases followed by hydrogen peroxide lavage as an adjuvant without refilling of the resultant cavity. Only in two cases, as in primary distal tibial case and proximal femoral case, an autogenous nonvascularized fibular graft was used, such as a strut graft aiming at internal stabilization of the weak affected part ([Figure 2]). Plaster of paris was used for fixation in six cases of lower limb affection ([Table 3]). Figure 1 (a) Radiograph of the left clavicle of a 17-year-old boy with an aggressive osteolytic lesion. (b) MRI of the same lesion with marked edema in T2 series. (c) Radiograph after intercalary excision of the lesion. 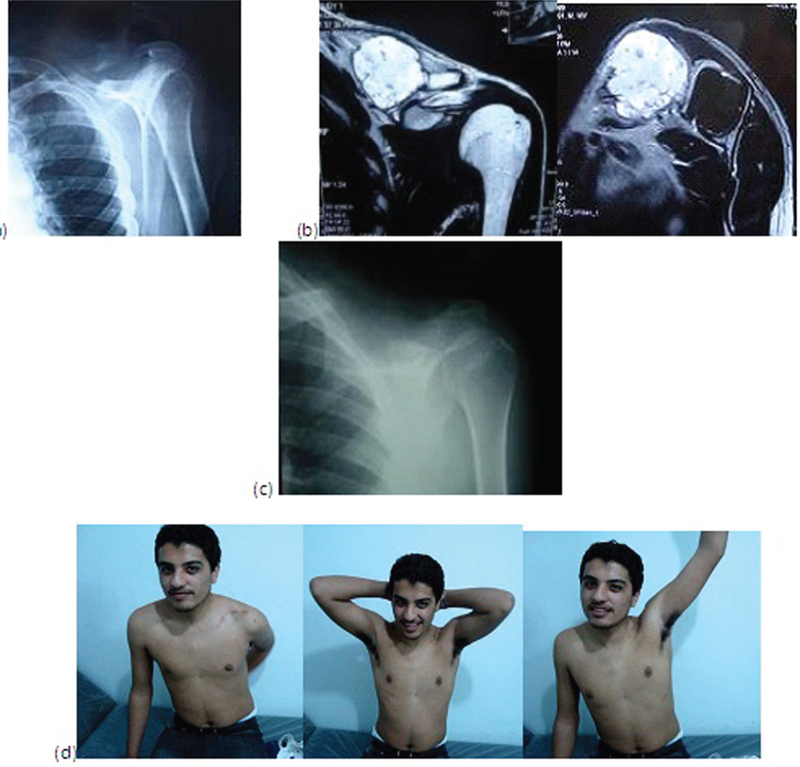 (d) Clinical photos of the patient showing normal function of the ipsilateral shoulder. Figure 2 (a) Radiograph of an osteolytic lesion in the distal tibia of a 15-year-old girl. (b) Computed tomography scan and MRI of the same lesion. (c) Postoperative radiograph after curettage − hydrogen peroxide lavage and strut autogenous fibular graft. (d) Radiograph of last follow-up with healing of the lesion and incorporation of the graft. Follow-up was done by regular plain radiograph until healing of the cyst seen radiologically. This was followed by removal of the cast and start of weight bearing. Patients in this study presented with variable symptoms and concerns as shown in [Table 1]. Two of the nine cases (distal tibia and distal femur) were presented by recurrent lesion, with parents being worried about it being a malignant disease. We had to perform rebiopsy of the recurrent distal tibial case because of the aggressive early recurrence (within 6 months) after the first surgery and the unusual radiological presentation ([Figure 3]). The differential diagnosis of this particular case was osteosarcoma, giant cell tumor, and hyperparathyroidism ([Table 2]), but finally proved to be SABC, which was managed by thorough curettage, hydrogen peroxide lavage without refilling of the resultant cavity. Seven of the nine cases were treated by aggressive curettage followed by hydrogen peroxide lavage as an adjuvant without refilling of the cyst after curettage. In two of those seven cases (proximal femur and distal tibial), an autogenous nonvascularized fibular graft was used as a strut to primarily stabilize the weak part of bone, so the graft was impacted inside the cavity; this graft was completely incorporated with local bone within almost 10 months of follow-up ([Figure 2]). All these cases had completely healed lesions and were able to walk freely with excellent functional outcome without any local recurrence or pathological fracture. The other two cases had lesions in the distal ulna and middle third clavicle. Both were treated by en bloc resection without reconstruction. Final follow-up of distal ulna and middle third clavicle showed excellent function of the wrist and shoulder joints, respectively ([Figure 1]). Figure 3 (a) A 6-year-old boy with recurrent lesion of the distal tibia with skip like lesion on MRI. Rebiopsy showed osteosarcoma in its differential diagnosis. (b) Two-year follow-up of the same lesion after curettage and hydrogen peroxide lavage. Six cases had an aggressive radiological picture ([Table 1]). Based on these radiological findings, diagnostic incisional biopsy was done in five cases before final surgery ([Table 2]). Pathologically, some of these cases that had biopsy before surgery had variable differential diagnoses ([Table 2]). Follow-up period ranged from 18 to 50 months, with mean follow-up of 33.6 months. The importance of studying SABC comes from its variable clinical, radiological, and histopathological features. Clinically, it can present with wide range of age incidence, as well as nonspecific anatomical presentation in spite of a higher incidence in short bones of the hands and feet. Radiologically, there are no specific features other than that known for the conventional aneurysmal bone cyst except in its solid nature in magnetic resonance imaging, and also the inflammatory picture owing to excess tissue edema because of release of inflammatory mediators ,,,,,,,. Pathologically, it is the most confusing dilemma, as its histological features can mimic many other conditions such as osteoclast giant cells, mainly giant cell tumor of bone, or brown tumor of hyperparathyroidism. Moreover, its spindle cell population, sometimes mitotic figures, and osteoid formation may make its discrimination from some varieties of osteosarcoma difficult ,,,. In this study, the incidence in male slightly exceeded that in female, which is contrary to some important reports ,,. It is reported that this lesion rarely affects the juxta-articular parts of long bones ; however, in this study, it presented in nearby joints in most of the cases. One of those cases was in the distal ulna, which was confused pathologically with giant cell tumor, a rare tumor in this particular site ,. 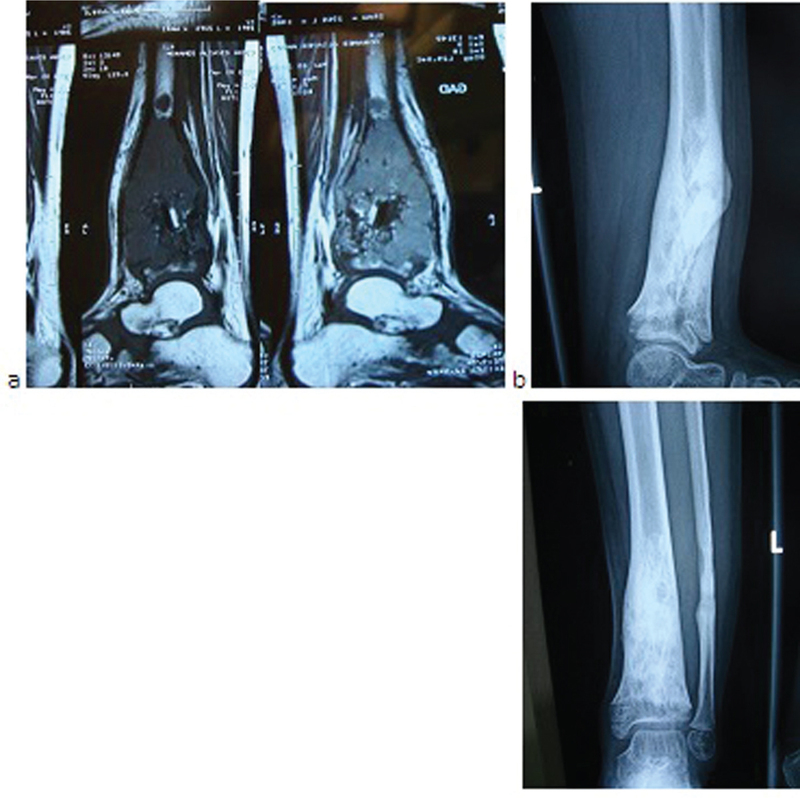 Approximately half of the cases had at least one differential diagnosis, one of those cases had both radiological and histological features as low-grade giant cell-rich osteosarcoma ([Figure 3]). Treatment of SABC does not greatly differ from that of the conventional type but some believe in more aggressive curettage as we do ,. In the literature, treatment of this condition ranged from incomplete curettage passing through thorough curettage to complete resection of the lesion. Some tried some adjuvants such phenol, liquid nitrogen, or hydrogen peroxide to minimize recurrence. Refilling of the resultant cavity after curettage was a matter of debate ,,,. In the current study, two cases were treated by resection of the lesion, and seven cases were aggressively curetted followed by hydrogen peroxide lavage as an adjuvant without refilling of the cavity. Only in two juxta-articular cases where the curetted site was mechanically weak, an autogenous nonvascularized fibular strut graft was used . The reported local recurrence of SABC varied from 0 to 75% ,,. The reported recurrence rate of SABC in long bones is less and its biological behavior is less aggressive than that of the same lesion in the short tubular bones. In this study and some other studies that discussed the lesion in long bones, the recurrence was nil until final follow-up ,,. Jaffe HL. Giant-cell reparative granuloma, traumatic bone cyst, and fibrous (fibro-osseous) dysplasia of the jawbones. Oral Surg 1953; 6:159–175. Sanerkin NG, Mott MG, Roylance J. An unusual intraosseous lesion with fibroblastic, osteoclastic, osteoblastic, aneurysmal and fibromyxoid elements: ‘solid’ variant of aneurysmal bone cyst. Cancer 1983; 51:2278–2286. Lorenzo JC, Dorfman HD. Giant-cell reparative granuloma of short tubular bones of the hands and feet. Am J Surg Pathol 1980; 4:551–568. Yamaguchi T, Dorfinan HD. Giant cell reparative granuloma: a comparative clinicopathologic study in gnathic and extragnathic sites. Int J Surg Pathol 2001; 9:189–200. Wold LE, Dobyns JH, Swee RG, Dahlin DC. Giant cell reaction (giant cell reparative granuloma) of the small bones of the hands and feet. Am J Surg Pathol 1986; 10:491–496. Bertoni F, Bacchini P, Capanna R, Ruggieri P, Baigini R, Ferruzzi A et al. Solid variant of aneurysmal bone cyst. Cancer 1993; 71:729–734. Oda Y, Tsuneyoshi M, Shinohara N. ‘Solid’ variant of aneurysmal bone cyst (extragnathic giant cell reparative granuloma) in the axial skeleton and long bones: a study of its morphologic spectrum and distinction from allied giant cell lesions. Cancer 1992; 70:2642–2649. Ilaslan H, Sundaram M, Unni KK. Solid variant of aneurysmal bone cysts in long tubular bones: giant cell reparative granuloma. Am J Roentgenol 2003; 180:1681–1687. Buirski G, Watt I. The radiological features of ‘solid’ aneurysmal bone cysts. Br J Radiol 1984; 57:1057–1065. Yoshida T, Sakamoto A, Tanaka K, Matsuda S, Oda Y, Iwamoto Y. Alternative surgical treatment for giant-cell reparative granuloma in the metacarpal, using phenol and ethanol adjuvant therapy. J Hand Surg Am 2007; 32:887–892. 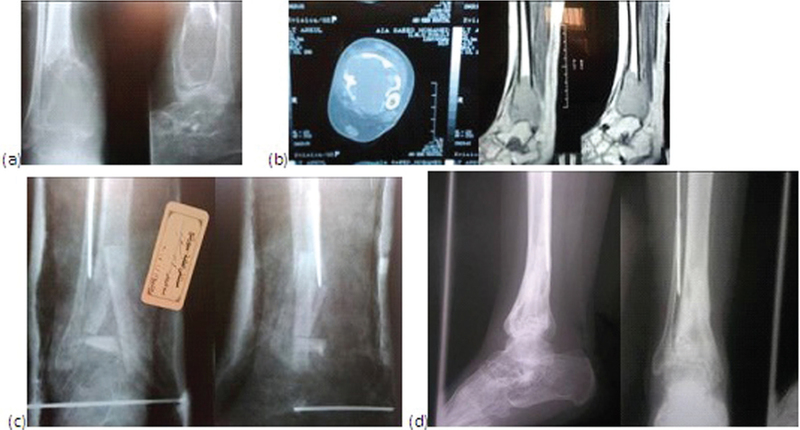 Takechi R, Yanagawa T, Shinozaki T, Fukuda T, Takagishi K. Solid variant of aneurysmal bone cyst in the tibia treated with simple curettage without bone graft: a case report. World J Surg Oncol 2012; 10:45. Enneking WF. Staging of muscoloskeletal neoplasm, from the Musculoskeletal Tumor Society. Skeletal Radiol 1985; 13:183–194. Yamamoto T, Marui T, Akisue T, Mizuno K. Solid aneurysmal bone cyst in the humerus. Skeletal Radiol 2000; 29:470–473. Schajowicz F, Granato DB, McDonald DJ, Sundaram M. Clinical and radiological features of atypical giant cell tumor of bone. Br J Radiol 1991; 64:877–889. Blackley HR, Wunder JS, Davis AM, White LM, Kandel R, Bell RS. Treatment of giant-cell tumor of long bones with curettage and bone-grafting. J Bone Joint Surg Am 1999; 81:811–820. Martti H, De silva U, Sidharthan S, Grimer RJ, Abudu DA, Tilman RM, Carter SR. Bone defects following curettage do not necessarily need augmentation. Acta Orthopaedica 2009; 80:4–8. George B, Abudu A, Grimer RJ, Carter SR, Tillman RM. The treatment of benign lesions of proximal femur with non-vascularised autologous fibular strut grafts. J Bone Joint Surg Br 2008; 90:648–651.